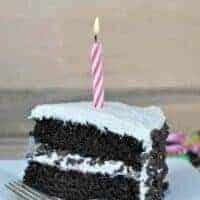 Looking for a tried and true chocolate cake recipe? This dark chocolate cake is rich and moist and the perfect, from scratch recipe you want! Topped with a smooth and creamy vanilla frosting and your sweet tooth will be satisfied! This week I turn 40. As in 40 years old. I made myself a “pre-birthday” cake. Once upon a time I looked forward to turning 30. I had 4 kids and I was ready for my 30’s! There were many occasions when I would receive comments about being a young mom, how I had so much to learn, etc. I was 23 when I had my first…was done by the time I turned 30. Yes I was young. But, it was right for us. I wouldn’t trade it for a minute! But now? See, I have friends my age who have little kids. 5 year old. 3 year old. Babies, even. Even though they are 40, they can pass for much younger because their children are so little. It doesn’t work for me. My oldest will be 17 this year. No mistaking it…I am officially old. BUT, and this is a BIG but, I am so thankful for all the experiences that have brought me to where I am in life (well, almost all of them, hehe)!! I am confident in who I am, what I do, where I’m going and how I’ll get there! I love myself too. Yeah, I may have some cupcake handles, and my abs aren’t as tight as they were when I was 20…but it’s okay. I’m okay. And because of that…let’s eat cake! I wish I could share a slice of cake with each and every one of you! Your sweet comments really make my day, honestly! And, this rich dark chocolate cake is just what a 40yr old birthday girl craves! In an electric mixer bowl, beat butter and sugar for 5 minutes, until smooth. Beat in eggs one at a time. Slowly add in dry ingredients alternating with the coffee/milk mixture (about 3 additions of each). Pour cake batter into two prepared pans (2-9inch round cake pans, lined with parchment paper and greased and floured). Bake in a 350 degree oven for about 25 minutes. Remove and allow to cool about 10 minutes before removing from pans. Cool completely on a wire rack before frosting. For the frosting, beat butter for 3-4 minutes until pale in color. Add powdered sugar, vanilla, and milk. Beat an additional 3-4 minutes until fluffy and smooth! To assemble cake, lay one layer of cake on a cake plate. Spoon 1/4 of frosting onto top of cake, spreading evenly. Top with about 1/2 cup of mini morsels. Add second layer of cake. Spread a layer of frosting around the sides of the cake and the top, very thin. This is your crumb coat. Allow to set about 15 minutes (or refrigerate). Apply final layer of frosting, spreading evenly and using a straight edge spatula to smooth. Using your hands in a cupped fashion, press mini chips around sides. Continue until all sides are done. 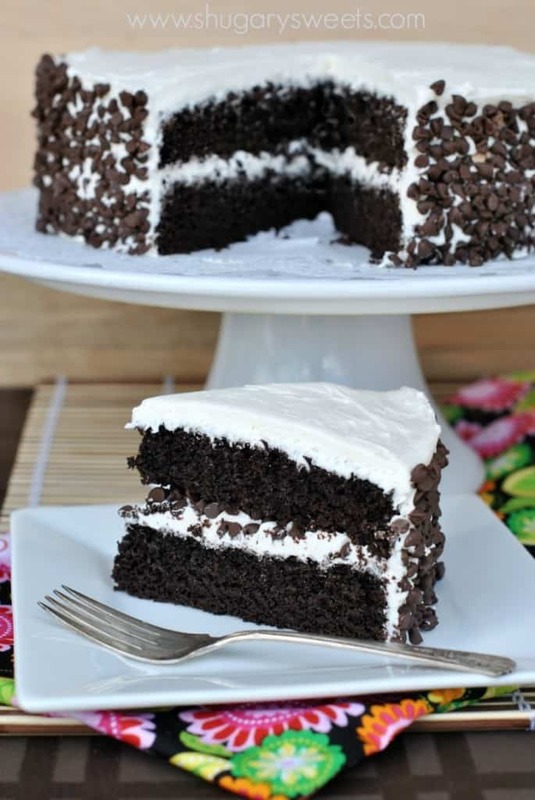 **The coffee in this cake just deepens the chocolate flavor. It does not make this cake taste like coffee in any way! If you absolutely must remove the coffee, just replace the 1/2 cup coffee with water. **To keep frosting off cake plate, lay strips of parchment paper under the first layer of cake, all the way around. Once frosting is applied, carefully remove strips of paper! **I used Wilton's Bake Even strips to get perfectly flat cake tops. If desired, slice dome of cake to make a flat layered cake. 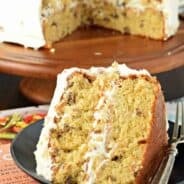 Looking for more delicious Cake ideas? 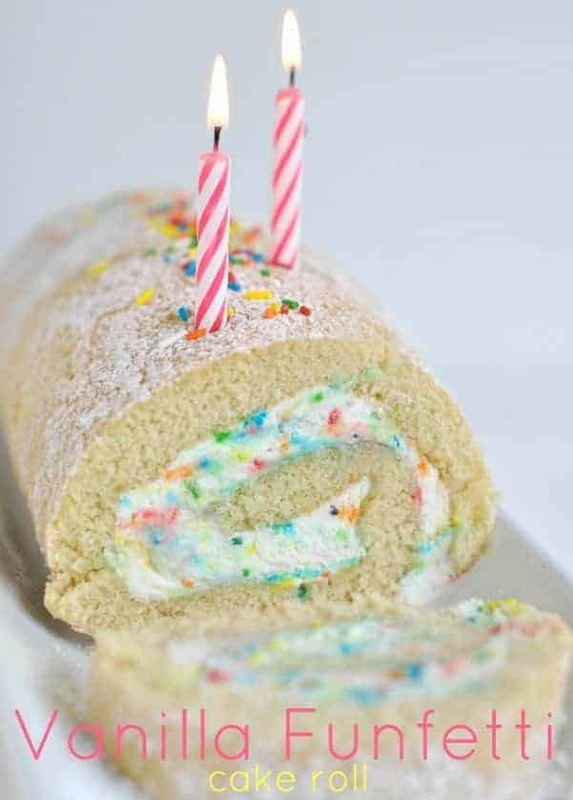 Vanilla Cake Rolls are easy and light, a perfect summer birthday treat! Add sprinkles for more fun! 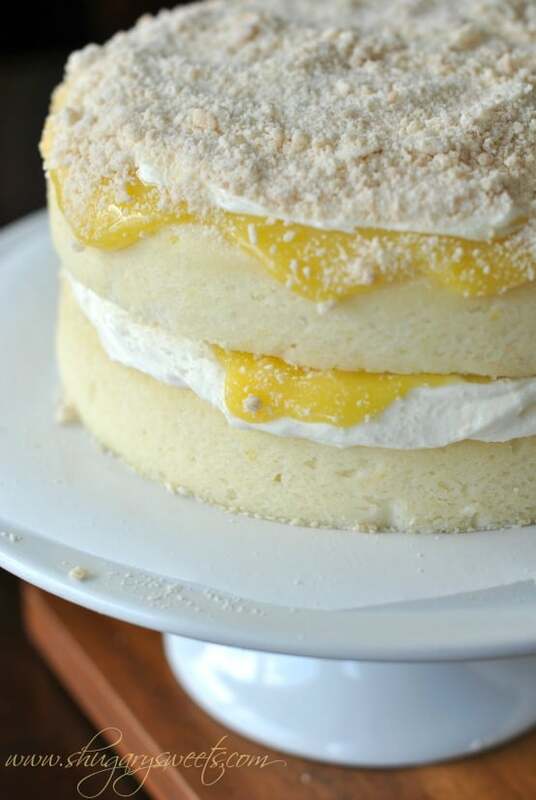 This Lemon Cake has a homemade Lemon Curd filling and Whipped Cream Cheese frosting too! Perfect for that citrus lover! Looking for something a little richer? A little bit more chocolate? 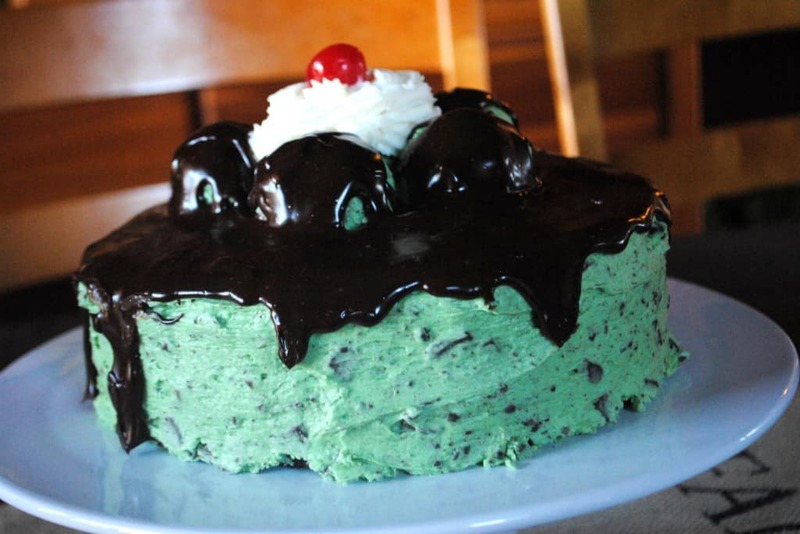 This Chocolate Cake with Mint Chip Frosting is your answer (don’t mind the old photos!!) The frosting truly tastes like mint chip icecream! You’re so lucky. You’re in the group of people who look young because you have a little one in tow…. My daughter is turning 13 in 22 days, which makes me officially old. My husband is four years younger than me, and he loves to remind me all the time how old I am. I think I definitely need this cake. It looks gorgeous. Happy birthday! I hope your kids spoil you and throw you a huge party. My husband is 5 yrs older, so at least I have him paving the way for me! Thanks for the birthday wishes, and Happy Early birthday to your almost teenager! You enjoy your 40th, Aimee! You’re still young, and its a great age. I didn’t feel old when I turned 40, but I’m really starting too now. I don’t feel I old, I just look it 😉 Thanks for the bday wishes!! Happy early Birthday Aimee! This dark chocolate cake sounds amazing! I love coffee and chocolate together so I know I’ll love this cake. I hope your family is doing something fabulous for your special day. And this cake – love it! Reminds me of the cupcakes you’ve made with the same batter. Or maybe this is a new batter? Regardless, looks so good! Thanks Averie 🙂 I can’t imagine starting at 49, but I guess it keeps him young!! haha! You’ll feel great at 40 Veronica! It’s all about perspective. And cake! So happy to be along with you in this time of life! I think it I great to embrace age! Either way it will still come! Happy per celebrations and lets eat cake!!!! I love that you made yourself a “pre-birthday” cake! Happy early birthday my friend. Wish we could share a piece together to celebrate! Awww, I wish we could celebrate together too…over doughnuts 😉 Thanks for the birthday wishes! Happy almost birthday!!! This cake looks AHHMAZING! And I love that you had your kids when you were so young-that would’ve been my ideal situation if I had my way. My mom was young too (22 when she had me, 25 when she had my brother) and I always LOVED that! Thanks for the bday wishes Kayle. My mom was 20 when she had me and my grandma was 21 when she had my mom…so we are a bunch of young women in our family (and my kids get the benefit of having their great-grandma in their lives…she turns 81 this year)!! Happy Birthday Aimee! Now you have your cake and you can eat it too!!! Looks so good! I hope you have a wonderful celebration with your family. 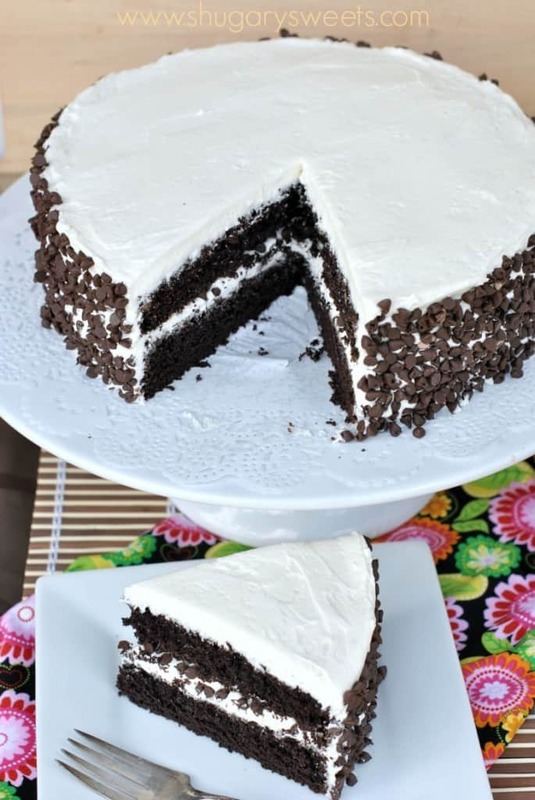 This cake is officially on my list to make, my family will love it — dark rich chocolate surrounded by creamy vanilla frosting and those little chocolate chips, can’t go wrong with this! Happy pre-birthday!! I fell on my 40th and ended up in a boot cast…it felt so womp..womp and old! Better now and good cake is the only way to celebrate!! Happy pre-birthday, Aimee! Your pr-birthday cake looks gorgeous! Have an awesome week, and hope it’s super sweet! Thanks girl!! Let’s do coffee when school starts!! Well, happy birthday to you. I turned 37 on Tuesday 🙂 I think time flies as I get older, so weird. Nice looking cake. I hope you have a very especial day! Well, if you say so…. so true. Great outlook 🙂 Thanks for the birthday wishes! Happy Birthday! and thanks for the new cake recipe. It’s going to be my cake for my 37th birthday next year. Also, I can’t guarantee I’ll share it. On a side note, I always thought I’d be married with at least 2 kids by now, and I’m still single. Just goes to show you that life laughs at your plans. Enjoy the cake Darlene!! I guess we can’t really plan everything like we thought when we were just teens! Happy Birthday Aimee! You don’t look a day over twenty. 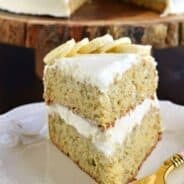 This cake is the perfect way to usher in your forties. Thanks for the birthday wishes Angelyn!! 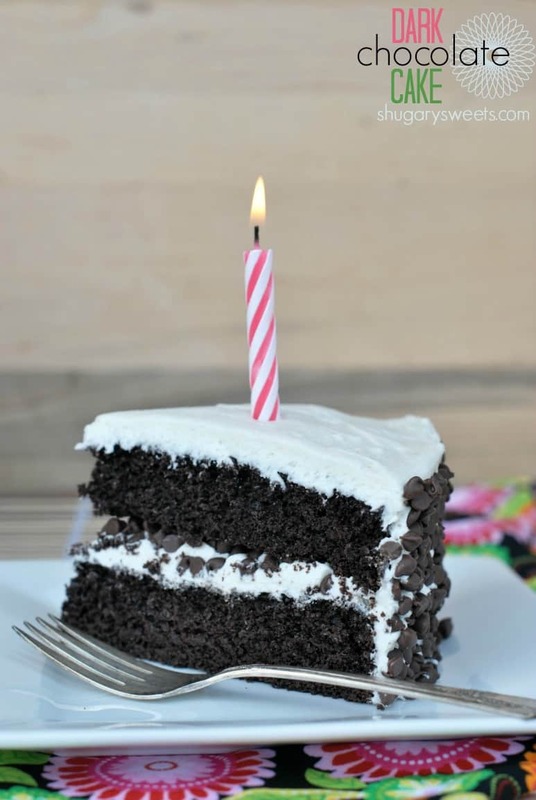 This is one of my all time favorite Cake /Frosting combinations! STOP IT YOU ARE NOT OLD! Old is like, way way down the road. You still have all the energy to run this awesome blog and make these fantastic cakes! I think you’ll be just fine heehee. 😉 I hope you have a lovely birthday though, Aimee (with more cake!). I do have lots of energy. But the 10 cups of coffee a day might help with that 🙂 Thanks for the birthday wishes Jess!! Aimee, continue to celebrate your life! Your timeline is close to mine; just one problem. My son didn’t co-operate. He didn’t have my one and only grandchild until he was almost 37. So, at 57 I thought of myself as an old grandmother. But, the best thing is I didn’t feel old and still don’t! Just blessed! Enjoy. Happy Birthday!! And stop it, you are not old. Not at all!!! You make such lovely delicious cakes..beautiful pictures..thanks for sharing the recipe will certainly try this delicious cake. Happy Birthday! I can tell by looking at the color of this cake that it is absolutely amazing and perfect for a 40th birthday! Happy Birthday Aimee…:-) You look so young, you don’t look like 40, I tought you’re under 30. You’re so lucky to have 4 kids . I will be 32 on 21st July and I don’t have any kid yet. My mom was 19 when she had me. That’s life….the important thing is happiness. Love your cake, nice blog. Keep posting! Amallia, Thank you very much for the sweet words 🙂 Have a blessed weekend!! Awww, sweetest comment 🙂 thanks for the birthday wishes Jann!! Happy almost birthday! I want to make this cake and it is nowhere near my birthday! I had a hard time turning 30. I just had my daughter 6 days earlier and baby blues had set in hard that day. Since then, birthdays have gotten much easier! 30 was a breeze for me!! So far 40 hasn’t been too bad, but I don’t think it’s hit me yet, LOL. Happy, happy birthday! This cake looks incredible! Happy Birthday Aimee! And I was looking for a chocolate cake for my hubby’s birthday next week. This may be it! Though I have other plans for the frosting. Enjoy the cake. Can’t wait to see what you make! This looks so delicious! And I love the idea of a pre-birthday cake! I’m 46 and I feel like my 40s have brought me clarity in that I finally figured out who I am, I’ve settled into myself. A real time of acceptance. I will say that so far this has been the hardest decade of my life, maybe the clarity that comes with age. Whatever. Remember this, age is truly just a number, it’s how you feel inside about yourself! Rejoice & embrace the changes that come next! Thank you Beth for these words!! I think clarity does come with age. And I think the hardships come from not only from getting older, but also less self centered and we see more around us! I have been craving chocolate cake like nobody’s business. I’ve tried making it a couple of times but it never came out just right. This cake however looks like chocolate cake perfection! Must make it soon. I love chocolate cake!! Deep dark chocolate cake 🙂 Good luck if you try it (and enjoy)! Happy almost 40th! I turn 40 this year too and I think this needs to be my months before 40 birthday cake! Looks amazing! I MISSED IT?! Happy day!!!! This cake looks amazing Aimee! i just made this as a end of summer celebration cake, its ready to come out of the oven and smells fantastic! thank you! Cakes are beautiful in image, I think these will be delicious too when I taste it. Thanks to author. 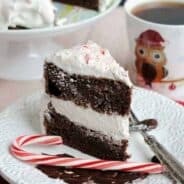 I made the chocolate cake with vanilla frosting for Christmas and it sure was good. Thanks for the recipe! It will be a keeper! Thanks Susan, so glad to hear you loved the cake! Thanks for stopping back over and letting me know! Happy New Year! What would be the cook time and temp for the dark chocolate cake if I wanted to make a single layer, rectangular shaped cake?. This cake looks delicious! Thank you for sharing the recipe! WOW! This cake looks so good, I can’t wait to make up a special occasion so I can try it! Any suggestions for making this gluten free? We’re doing a group Thanksgiving with a gluten intolerant friend and I’d love for her to be able to have some but I’m nervous about the greater density of gluten free flour mucking things up! Could you please tell me what brand cocoa powder you would use? Is it dutched or natural? Thank you.